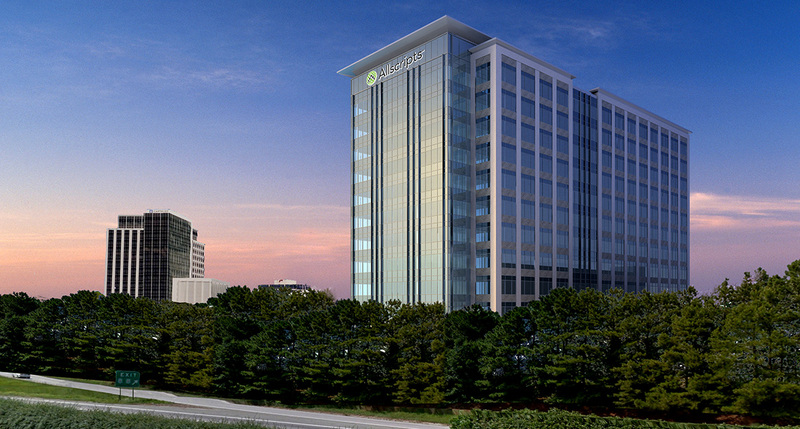 Real estate sources across Raleigh are saying that Allscripts Healthcare (Nasdaq: MDRX) is close to signing a big office lease deal to move all of its people and operations out of The Forum office park in north Raleigh to a higher profile, 18-story building at North Hills. John Kane, chief executive of North Hills’ development company Kane Realty Corp., says no lease with Allscripts has been signed, and he denied that they were close to any kind of agreement. But sources say the health care information technology company, which employs more than 1,260 people in Raleigh, has been considering either a deal to renew a contract for office space that it occupies in three buildings at The Forum or to relocate elsewhere in the Raleigh area. Allscripts, which is based in Chicago, in 2013 restructured its lease for 304,622 square feet in the Forum II, Forum IV and Forum V buildings on Six Forks Road, according to Wake County records. Highwoods Properties (NYSE: HIW) acquired the five office buildings at The Forum in 2008 in a joint venture partnership with German REIT Kapital-Consult. At North Hills, Kane Realty is already constructing an 18-story office tower – North Hills Tower Two – that will be completed in spring 2016 and have 300,000-square-feet of leasable office space, but real estate sources say that Allscripts is instead negotiating to have its own 18-story tower build on another site at North Hills. The North Hills master plan has three more office towers designated on the east side of Six Forks Road after Tower Two is completed. If Allscripts does decide relocate, it would be another blow for the businesses around The Forum office park on Six Forks Road in north Raleigh. Across the street at the Colonnade office park, anchor tenant Salix Pharmaceuticals in early April announced it would lay off 258 workers in North Carolina primarily at its corporate headquarters at Colonnade, following its merger with Valeant Pharmaceuticals (NYSE: VRS). Allscripts works in many facets of health care information technology, including in a big way around electronic health records, something health experts hope will help keep health care costs in check. Many patients see multiple doctors, specialists and pharmacists who don’t work as a team to synchronize care. That’s a problem because an estimated 117 million Americans have at least one chronic condition, such as diabetes or heart disease that may require care from different types of health care providers, according to the Centers for Disease Control and Prevention. However, important information isn’t always communicated among these different providers, increasing the potential for miscommunication and unnecessary hospital readmissions, according to Blue Cross and Blue Shield of North Carolina, something a more integrated health records system could improve. This “rebalancing” affected about 3 percent of the workforce, though the spokeswoman did not give more information about which employees were affected. Nearly 18 percent of Allscripts 7,150 employees worldwide were based in Raleigh, as of last March. Shares have declined in value for much of the past year, partly on poor third-quarter financial results, dropping the company’s market value to about $2.35 billion. Last year, Allscripts recorded a net loss of $66 million on $1.4 billion of revenue. It was the third straight year of a reported net loss. President and CEO Paul M. Black received an average total compensation of $8.9 million in each of those years, including total compensation of $10.5 million last year, mostly through stock awards.